The information provided on this page should get you the information you to need to design and print your EDDM postcards with all of the specifications required by the USPS. If you need help on how to pick out the mail routes you want to target and how to prepare your postcards for delivery to the Post Office please check out our Simple EDDM Tutorial Page. We also have provided design tips and examples of EDDM postcards to ensure you get the best response possible from your campaign. We also highly recommend sending more than 1 postcard to each address! The information on this page is specific to a Retail EDDM campaign. The requirements for a BMEU EDDM campaign are slightly different when it comes to the indicia. If you are sending less than 5,000 EDDM postcards per ZIP Code per day, you are in the Retail EDDM category even if you are a business! The postcards must be at least .007″ thick, but not weigh more than 3.3 oz individually. You must also send 200 pieces per ZIP Code unless there are fewer than 200 stops on those routes. Think of indicia as the replacement for the stamp and address you would normally find on any mail piece. You can download the indicia for use on your Retail EDDM postcards below. Before we get too far along, please check out the postcards I used in my 20,000 piece campaign below. I am not saying these are super well-designed postcards, but they were very effective and got us very good results. Since I mailed the same 10,000 houses twice, I decided to design 2 different postcards. You could send the same exact postcard twice, but I thought it would be a good idea to create a new design for the 2nd mailing. Please note the indicia on the back of the postcards. If this is not properly placed on the postcards, there is a good chance the Post Office will refuse to send them out. That would be a big waste of time and money! If you are not artistically inclined and don’t have anyone you know who is, it would be a very good idea to hire someone to design your postcard. I would recommend checking fiverr.com or upwork.com to find a quality designer at a very reasonable rate. If you want to do this yourself, I have some tools that may be helpful. 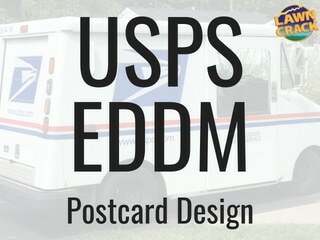 What size should I make my EDDM Postcard? 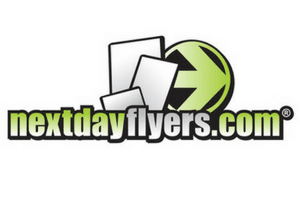 We love NextDayFlyers.com for our printing needs. 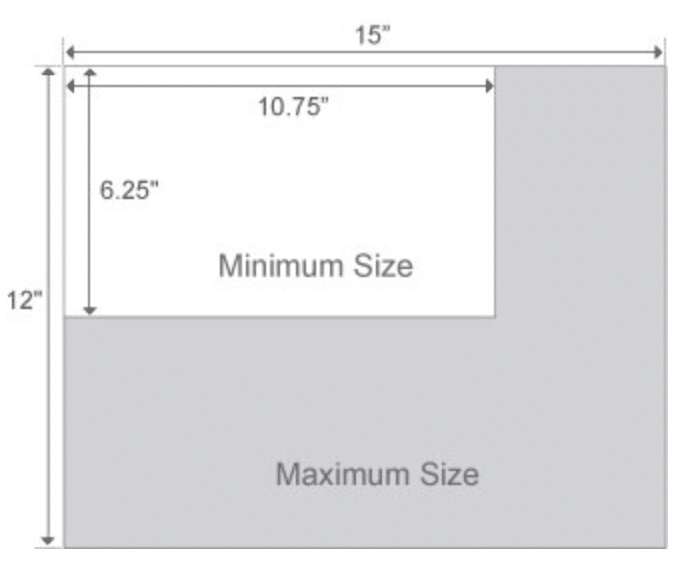 They recommend choosing 6.5″ x 9″, 6.5″ x 11″, or 8.5″ x 11″ as the size. You can opt to make your postcard any size as long as it meets the USPS size guidelines. The cards you saw in the examples above were 6.5″ x 9″. What should I include on my postcards? 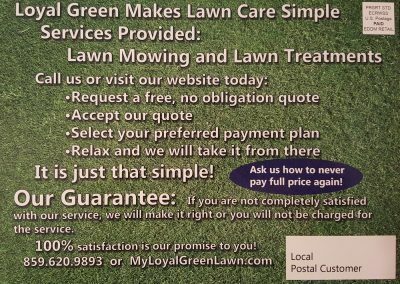 The very basics of what to include on your postcard are your company name, logo, phone number, and website. It should be very easy for the person receiving your postcard to know what you do and how to contact you. A good image will go a long way to getting them to read the text. If possible, make it clear what problem your service solves for them! Below I go into more detail on how to design an EDDM mailpiece that will get read and get them to take action. An attention-grabbing image! Do not discount the importance of how your postcard looks. People will first see the image on your postcard before they read the words. Make sure this represents your company well! In the examples, I choose to use a family enjoying their lawn in one and a nice picture of the sky in the other. Coordinate your colors! With all of your marketing material, you want to keep the colors you use consistent. Often, this means using your company colors typically found in your logo. 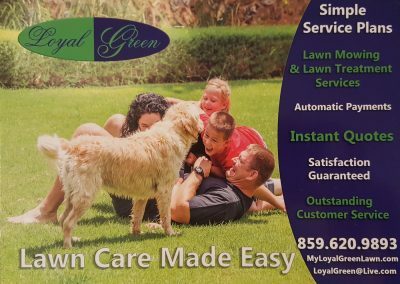 In the examples, Loyal Green’s company colors are green and blue so those are the colors used throughout the postcard design. Have a bold headline! Once again, use this to grab attention. You can choose to make it clear what you are offering, create a desire for the viewer, or ask a question. Whatever it is, you want to get them to read more. 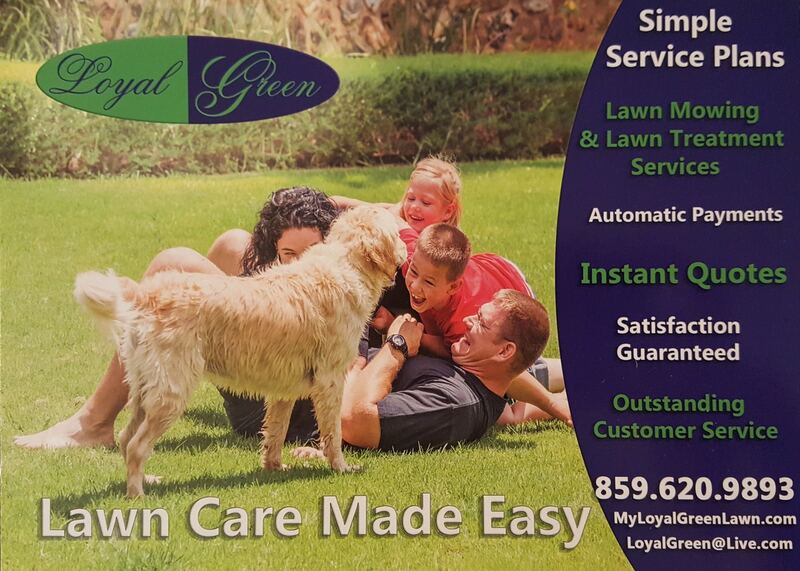 In the examples, our headline is ‘Lawn Care Made Easy.’ That is what Loyal Green does. 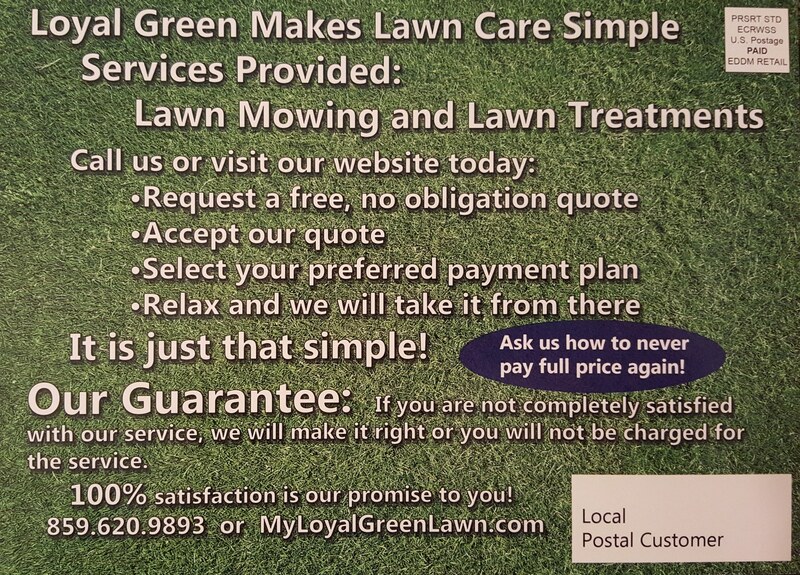 We make maintaining your lawn super easy by offering reliable service and easy payment options. What problem do you solve? People are willing to pay companies to solve a problem that they have. 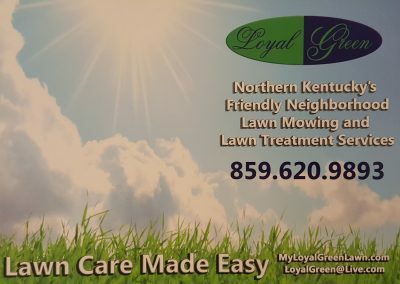 Maintaining a lawn and landscape is usually not that easy if you do not have the proper tools, time, or physical ability. Make it clear how your service improves their life in some way. 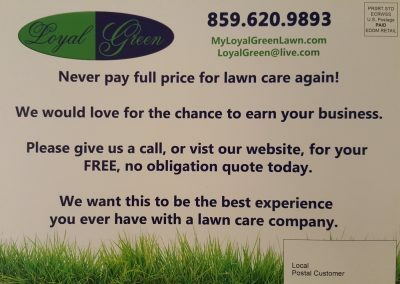 In the examples, we included words on the postcard that lets them know how easy it is to request a quote and pay, along with the fact that we want to earn their business and that we are trustworthy and guarantee our work. Make a limited time offer! People in general love to procrastinate. If you can, incorporate a deadline to take advantage of your offer. Since you know when you are sending your cards out, you could say, “Sign up by March 31st and get your first mowing service free.” Or something similar along those lines. I did not include this in the example postcards, but if I were to do it again, I certainly would! Have a clear Call-to-Action! What do you want the people receiving your postcards to do? Make it very clear. Whether it is call us now or fill out a quote request on our website. You want to lay this step out for them. In the examples postcards, I choose to use call us or visit our website today. Consider a special code. You always want to be tracking your ROI, return on investment, with all of your marketing efforts. Maybe incorporate something like, “Use the promo code, ‘Spring Mailer,’ to get our best pricing.” It is a good idea to simply ask everyone how they heard of you also, but if you run multiple postcard campaigns you could identify them with a code to know which one is performing best. I didn’t use this in the examples, but it is a good idea and I would more than likely include it if I ran another campaign. If you do want to design your postcards yourself, here are several tools that will assist you in the process. Remember that you will need to account for ‘bleed’ in your design. The bleed area is the perimeter of your card. This is a 0.25″ buffer because once your cards are printed, the printer will cut off the edges to make your card the proper side and ensure the ink goes all the way to the edge. 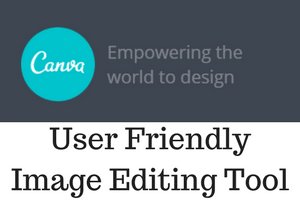 Canva.com is by far the easiest to use picture editor I have ever used. No technical skills are required to make awesome graphics that pop! The cost is minimal and they have a free trial. 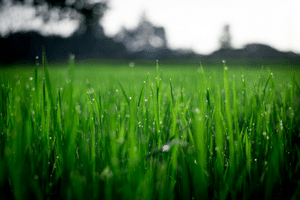 Pexels.com is a great free stock image sources, just like this picture of grass with dew on it. The pictures you get from Pexels are free to use in your business marketing pieces. 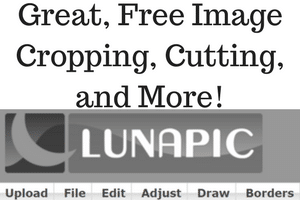 Lunapic.com is the best free image cropping tool I have found. It also has many other features I have not played around with yet! I use this to alter images before editing in Canva. 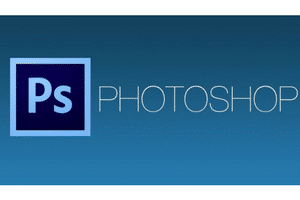 Photoshop is the standard in professional design. It is not very user-friendly for beginners, although there are lots of tutorials on YouTube to help you learn. They have a free trial and then it is $19.99 per month. Although you can make your design in Canva, if you are familiar with professional design software Photoshop and Inkscape offer just about every design option you could ever imagine! These tools are not for beginners! 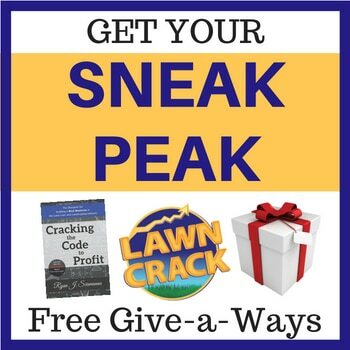 If you have never used a software program like this, it is going to be overwhelming and hard for you to do anything without a lot of learning beforehand! 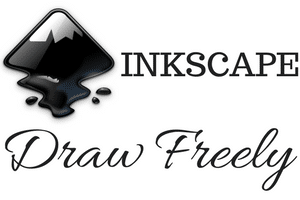 Inkscape.org is much like Photoshop but is completely free! It is complex but also has many tutorials on YouTube to help you learn anything you need to know. If you are familiar with design software, this is an excellant option. Who to use to print your postcards? 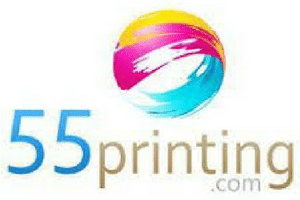 I would recommend checking out the following online printing services. Don’t forget to check with your local printers as well! I have used them in the past and was very happy with the quality and price. Ethan has used them in the past and was very happy with the quality and price. 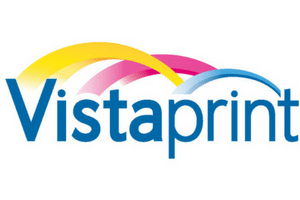 They are probably the biggest online printer out there. Definitely worth checking out. Need help with designing your postcards? Here are 3 options to pick a designer at a very reasonable rate! I have used them in the past and will do so again. Keep in mind, your experience will depend on who you select to work with! 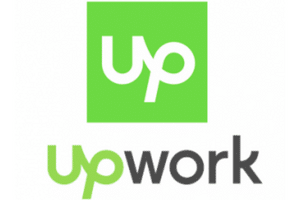 You can get work done cheap with any of these 3 platforms. 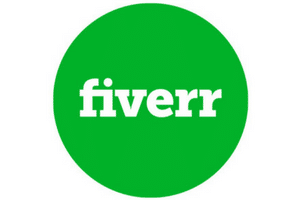 I have used Fiverr in the past and was very happy with the quality and price. Again, your experience will be determined by who you pick to do your work! 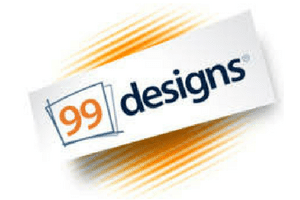 I have not used 99Designs yet, but I think their platform is going to best suit my needs with an upcoming project. Once again, make sure you pick your designer wisely!